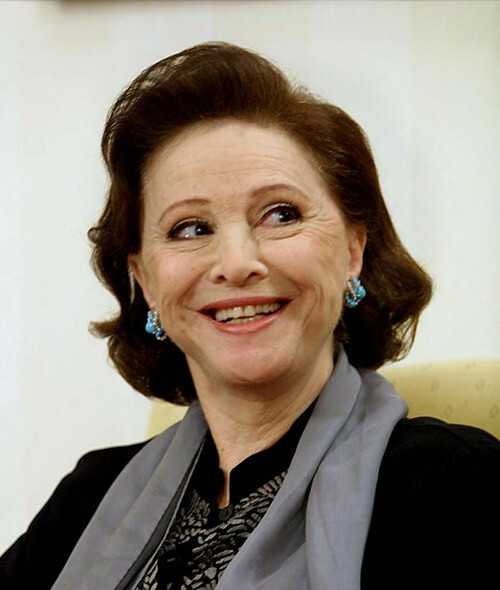 Mrs. Faten Hamama, fondly called the Lady of the Arabic Screen, not only changed the Egyptian film industry, but also showed through her roles the extent to which women in Egyptian and Arab societies can be strong, self-determined, and independent. She won her first acting role at the age of 8 and at 15, she was enrolled at the High Institute of Acting in Cairo. Early in her career, she took on roles in films such as Kursi Al L’Etraf and won the lead role in Lak Yawm Ya Zalem, a film nominated for the Prix International at Cannes. As her fame grew, she consciously selected roles that addressed societal taboos including honor killing and divorce. Later in her career, she was drawn to roles that promoted pro-democratic themes, including Imbaratoriyyat Meem. She took up television and film roles in Dameer Ablah Hikmat and Wajh al-Qamar. Faten Hamama was born in 1931 in Elmansoura, Egypt. Egyptian president Gamal Abdel Nasser awarded her the Decoration of the Republic in 1965. She also received the Lebanese Order of Merit in 1984 for her role in The Night of Fatma’s Arrest. She was later presented 10 awards, including one at the Montpellier Mediterranean Film Festival in 1993, and another at the Dubai International Film Festival in 2009. In 2001, the Egyptian Writers and Critics Organization chose her as “Star of the Century” at the Alexandria International Film Festival. She has received an honorary doctorate from the American University of Cairo in 1999 and from the American University of Beirut in 2013. Faten Hamama passed away on January 17, 2015.